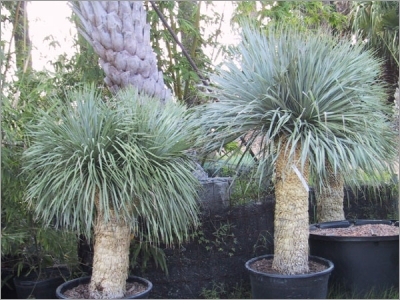 Yucca rostrata, the Blue Beaked, Big Bend Yucca, Old Man Yucca, is truly the most spectacular of the desert Yuccas for the garden, and certainly one of the most hardy of the trunk-forming species. It is from Texas and New Mexico and grows to 4-5 meters tall. In 5 years, expect a 8' trunked specimen. This tree is grown for foliage. Extremely beautiful and architectural plant with a dense crown of narrow blue-green leaves. The narrow powder blue foliage radiates out from the head of the central stalk. The leaves are 25-60 cm long, 1 to 1,5 cm wide, with margin of the leaves yellow with short sharp teeth. 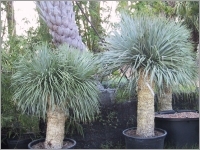 In general Yucca rostrata is a single-trunked species, but sometimes forms several heads of leaves. Beaked Yucca flowers are white and form flower stalks that rise above the plant. The panicle is about 60 cm long. The flowers are bell-shaped, 3.8 cm wide; with 3 petals and 3 sepals, and appear in June to September. The species name rostrata refers to the fruit, which truly resembles the beak of a bird. Yucca fruit can be cooked and eaten after the seeds are removed; the large petals are used in salads.